The Liberty fabric above costs roughly $45/yard, slightly less if you're a lucky eBay bidder (click on the image if you feel lucky, punk). And though I often recommend that if you possibly can, you should sew with Liberty prints, many people tell me that they couldn't possibly cut into such expensive fabric — even people who have been sewing for many more years than I have, even people who have made tailored jackets, for pete's sake. They're too afraid they'll screw it up. So I was wondering about this, and decided (very uncharacteristically for me) to do the math. 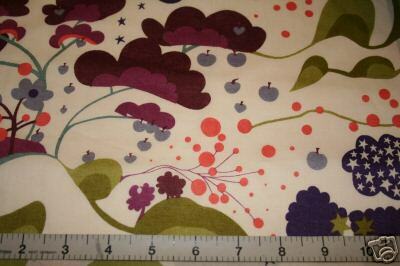 So let's say you buy fabric for four Liberty-print dresses: that's ($45*4 yds)*4, which would be $720.00. And let's say that you ruin, beyond hope of recovery, ALL FOUR of your Liberty-print projects. That's a lot of money wasted, right? That's a month's rent for some people. Two or three car payments, maybe. Months of groceries, depending on how many teenage boys are in your household. It's also 5.76 $125 dresses bought at a department store. (I'm taking $125 NOT as the median department-store dress price, but because it's the absolute maximum price I think I could bring myself to pay for a new dress off the rack.) Have you bought more than 6 dresses in your life that you didn't like? That you wore once, maybe? That hung in your closet until you pushed them into the forgiving arms of the Salvation Army? (Replace "$125 dress" with "$45 sweater" and "6" with "more than I want to recall" and you have MY experience.) What did you learn from buying those dresses? A lot less than you would have learned from trying to sew them, I wager. Here I'm assuming (highly unlikely) that you would be unable to salvage anything that you had sewn … but I'm also assuming (highly likely) that you would learn a GREAT DEAL from four sewing projects, even if they were all sobbing failures. So much so that with the *next* project, you would most likely make something wearable. That's just what failure is, or what it ought to be: failure is just figuring stuff out the hard way. Almost every Saturday morning my little boy and I go roller-skating together. And every Saturday I tell my son (who HATES to fall down) that if he doesn't fall down, he won't learn anything. If you don't fall, you won't ever know how fast is too fast, how tight is too tight to take a turn, how soon (after a mega-blast blue-raspberry Slurpee) is too soon to head back to the floor. And if you don't screw up something — anything — in your life, you won't ever know how good you could have been. So I *hate* it when someone tells me they don't want to try something because they might screw it up. So what? Unless what you're trying to do involves tightrope walking 5000 feet up, you probably won't DIE. And short of death, almost everything is fixable. Don't ask me for advice if that's not what you want to hear, because I'm the person who is going to tell you to take the new job, to ask the guy (or girl) out already, to move to the new city, to wear orange. I'll tell you to stop focusing on what you might lose, and start thinking about what you might LEARN. Sometimes when people say they're afraid of failure, what they really mean is that they are afraid of humiliation. Which is completely understandable. But, speaking as someone who has felt humiliated more times than she'd like to remember, humiliation passes. (It passes like a kidney stone passes, but that's another story.) Not to mention that humiliation passes differently for each person: you remember it for months; the witnesses remember it for seconds (they have their own humiliations to obsess over, and don't have time for yours). You wake up the next morning, same as always. You head back into work, you run into that guy again ("Uh, hi! "), you get a new haircut to fix the one that wasn't such a good idea, after all. But at least you tried, and now you know something you didn't know before. Or … you try, and it works! It works beyond your wildest dreams. (Insert wildest dreams here.) Even if it works a little bit short of your wildest dreams, that's still further along than you were yesterday. And there's no rule that you can't try again. So, that thing? That thing you've been scared to try, because you think there's NO POSSIBLE WAY you could do it? That everyone would point and laugh when you fell? Today looks like an EXCELLENT day to give it a shot. Take it from me. (Everyone's looking the other way, anyway.) Go for it! I was not “tooting” my own horn but merely pointing out people here do not need lectures on charity. there was no reason to make disparaging remarks on a person’s eloquent (an I mean Erin’s not mine) encouraging words on learning to be brave. erin, I really like this blog. It is the first time I read your blog and I really amaze on the content of your writing. oh. my. god.i know this is an old post (i only just found dress a day, and am reading backwards through the archives, yay!) but i have to comment.no, i have to THANK! Thankyou, Erin, for making me realise what nothing and nobody else has been able to. i’ve been in such a funk lately, and too despondant to attempt to do anything, due to my paralysing fear.also, top drawer blog. know that as i type, my eyes keep flicking to the seam ripper and dress i am about to transform into pure awesomeness.